In the golden, glowing place of fellowship with God – the Holy Place – is a Table. The Table is laden with bread. It is a place of provision, a place of communion, a place where the priest meets with God and eats the bread in His presence. This is the Table of Shewbread. No longer in the bright glare of the sun in the Outer Court of the Tabernacle of Moses, now we are in the room of gold. 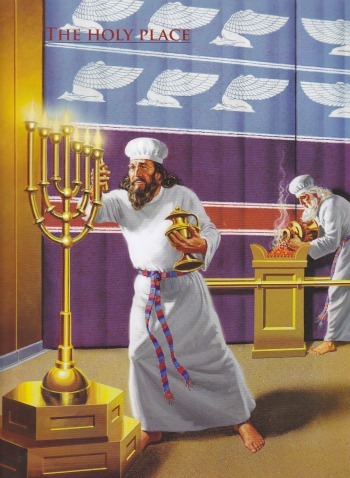 The Golden Lampstand is the only source of light here and casts the glow from its seven lamps over the Altar of Incense and the Table of Shewbread. A table is a place to eat and to fellowship with others. A place to gather around to commune and to break bread together. In fact, tables hold great significance in life. The table is the place where family comes together to eat and to share in each others’ lives. Studies have been conducted demonstrating that children from families who eat together 4 or more times a week do better academically and emotionally. This is because around the table we are united, we communicate and we bond with each other. It is a place of security and stability for children and adults alike. In the Tabernacle it is no different: the Table of Shewbread is the place where the priests were to gather together to eat the Bread of the Presence as one, in God’s presence. Remember the Table is in the Holy Place and the Holy Place is the place of Fellowship. The Table of Shewbread, as with all of the other furniture in the Tabernacle, first and foremost points to Jesus Christ. The Table was made of acacia wood, overlaid with pure gold. Once again this reflects the dual nature of Christ, the God-Man: the incorruptible acacia wood, His sinless humanity; and the pure gold, His deity. 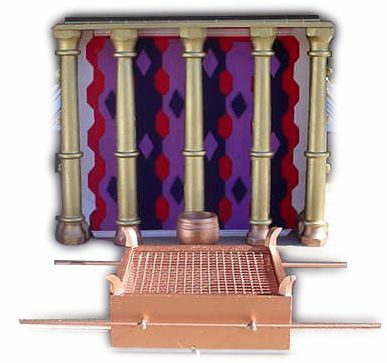 The table was the same height as the Brazen Altar’s grate in the Outer Court and the Mercy Seat in the Most Holy Place – 1 ½ cubits. We begin at the Judgment seat (the Brazen Altar: cross) so that we may come to the Table for fellowship with God and His Priests on the basis of the shed blood of the Mercy Seat. The Table had a gold moulding around the edge measuring one hand’s breadth with a gold crown on top. The crown speaks of His Kingship. He is the King of Kings. 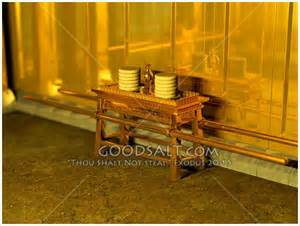 The gold moulding speaks of the protection of His people, a golden enclosure surrounds them. It measures one hands’ breadth: He holds His people in His hand. The Shewbread, or Bread of the Presence, also points to Jesus Christ. “Shew” means to “tell forth” or “declare”. 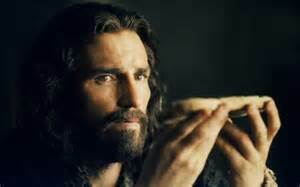 Thus the Shewbread “tells forth” or bears witness to God’s Son, Jesus. See Jesus was never an after-thought nor Plan B, because God’s first plan didn’t work. No, Jesus was always God’s plan of redemption to a fallen world, (See Genesis 3:15). He is the only One, the Only Way and He has always been so. Thus the Old Covenant in the Old Testament tells forth of Him. 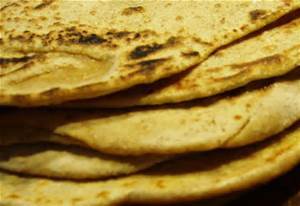 There were two piles of six unleavened loaves on the table. 12 is the number that is used consistently in the Bible for Israel. It is also the number for Apostolic fullness and Governance (think of the 12 apostles and the 24 (12×2) thrones in Revelation 4:4. Bread was made from fine flour. The flour was made from harvested wheat. The wheat had been alive and growing, but then the wheat was harvested and died in order to be ground to fine flour to become bread. This foreshadows Jesus’ suffering and death. Jesus was alive, but He suffered and was crushed under the weight of bearing the sin of the world. He died and by His death He gives life to the world. The bread was baked in fire. It was an offering to the Lord by fire: this also speaks of the sufferings of Christ and His obedience unto death. Incense always speaks of prayer and intercession. Remember the Altar of Incense was the place of intercession. So frankincense sprinkled over the Shewbread speaks of Jesus’ life of prayer and Intercession. Jesus is the living bread – all who eat of Him will never die because He is life. Shewbread in its physical form was a picture of Him being the true, spiritual Bread of Life. Manna was also a picture of Him. The Manna and the Shewbread were simply shadows – He is the reality. He is the divine Bread sent from Heaven to provide the answer to sin, to provide life to us, to sustain us, to keep us, to fill us. Just as the priests ate the Bread in the presence of God at the Table, so we too need to eat of Jesus regularly in God’s presence. This is not the Catholic false doctrine of the Eucharist – no – it is by eating of the Word of God in the light of the revelation of the Holy Spirit (the Golden Candlestick). We are to daily eat the bread of the Word of God which reveals Jesus to us. 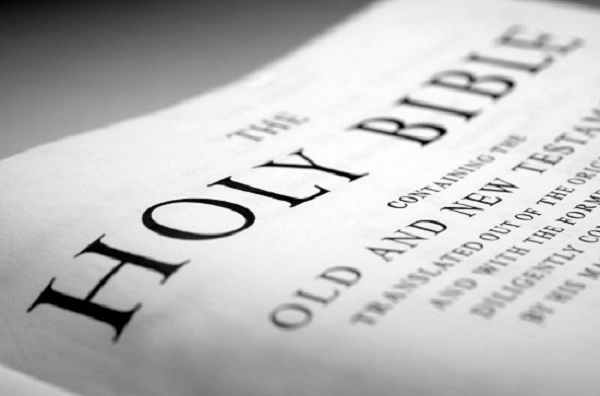 Now we have the written Word which reveals to us the Living Word. The Shewbread was replaced regularly – we have to come to the Word of God regularly for fresh bread. The Shewbread was covered in Frankincense, and we need to come to the Word of God in prayer. There were also bowls, cups and pitchers on the Table of Shewbread. They were made of pure gold. With the Shewbread the priests were commanded to offer a drink offering to the Lord – wine from the gold cups, pitchers. This is a picture of Jesus’ shed blood being poured out for us. So we see the Priests breaking the bread and eating it and pouring out the wine in the presence of God, in unity and as a witness to Christ. Communion is the place where New Covenant believers gather together in the unity of the Holy Spirit in the presence of God and remember the Lord’s death. Once again we see those words “shew forth”. Communion is also a witness, a testimony, to what Jesus has done and that He is coming back soon. Praise the Lord! Remember the Golden Lampstand illuminates the Holy Place – it sheds light on the Bread – the Word of God. This is a picture of the Holy Spirit bringing revelation to us through the Word of God. But even more – we are now to share in His death and sufferings, we are to know Him and the fellowship of His sufferings. We are now to be broken bread and poured out wine to a dying world. Paul said in 2 Timothy that his life is being poured out like a drink offering. We know that Jesus, the Table, will hold us and support us through it all. Categories: Jesus and The Tabernacle | Tags: Christian, Christianity, communion, fellowship, holy place, Jesus Christ, Moses, Old Covenant, shewbread, showbread, tabernacle, table | Permalink. It will come as no surprise to the student of the Word that each door represents Christ Jesus Himself, He whom called Himself “the Door”. It’s all about Jesus. 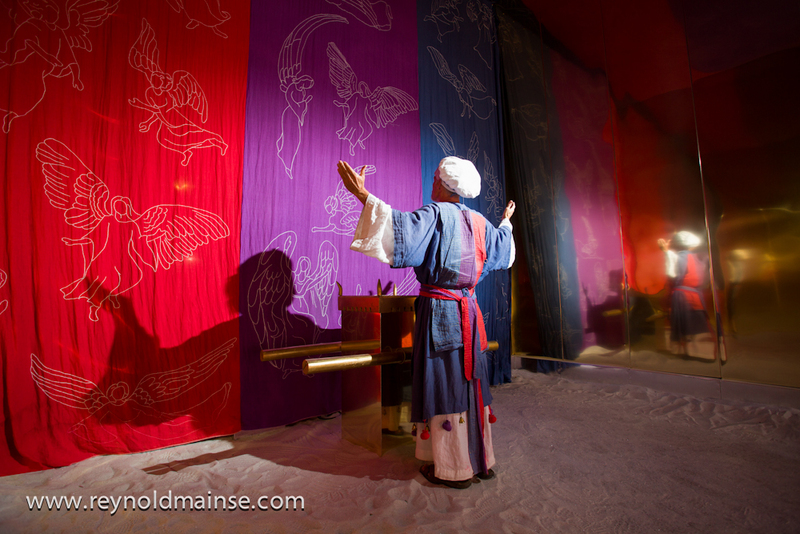 The study of the Tabernacle is simple when you realise it is all a testimony to God’s beloved Son. 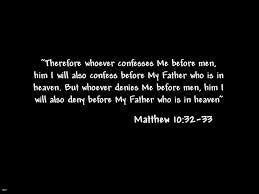 It is also a teaching tool He has given us to show us many wonderful truths about Christ and about us, the Church. Previously we have looked at the Gate and the furniture in the Outer Court of the Tabernacle: the Brazen Altar and the Brazen Laver. 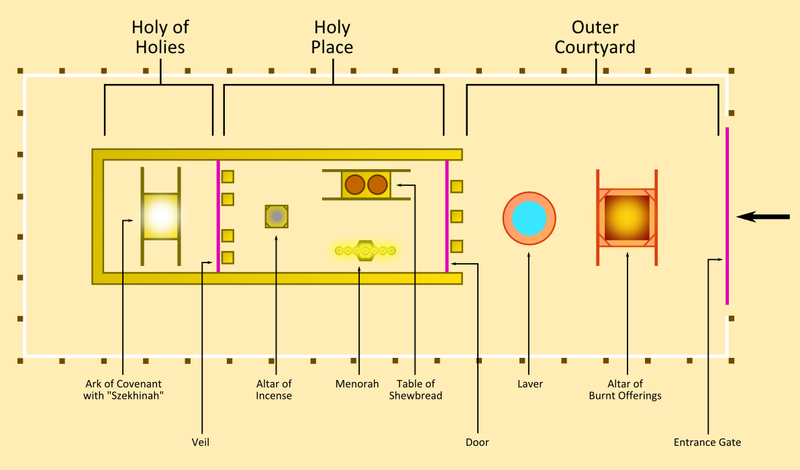 Now we will look at the Door, which was the barrier between the Outer Court of the Tabernacle and the Holy Place. The Door was made of woven blue, purple, scarlet and white fine linen. Five pillars supported the Door. These were made of acacia wood and overlaid with gold. The sockets for the door were made of brass. So we see that the five pillars point to Christ. “He….upholds (the door) Himself as He invites every qualified person to enter for priestly privileges.” Portraits of Christ in the Tabernacle, Theodore H Epp. In the Outer Court brass is the main material used, as seen in the Brazen Altar and Laver (brass signifying God’s judgment). However in the Holy Place it is a very different case. Gold is used extensively in the Holy Place and here, in the pillars of the Door accessing the Holy Place, we see for the first time the use of gold. 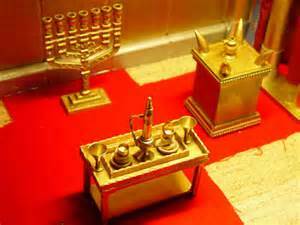 Brass always signifies God’s judgment and is used only in the Outer Court of the Tabernacle. Remember that we are at the point in between the Outer Court and the Holy Place. So while the five pillars point to Jesus in His dual-nature of God and Man, they also point to judgment (brass) and grace (five). There was only one place where God’s judgment and His mercy/grace met – and that is the cross of Jesus Christ. As we saw in the study of the Brazen Altar, Christ took the judgment for our sin upon Himself at the cross. So now as we pass through this Door into the Holy Place we see once again that the only way to enter fellowship with God is through the atoning work of His Son at Calvary. To approach the Father is only possible through the one Door, Jesus Christ. Imagine standing at the Brazen Altar or the Laver in the Outer Court and looking up at this Door. The brilliant colours of the fabric intricately woven together, the sunlight catching the light on the gold of the pillars holding up the fabric. Surely the beauty of that door would have caused the average Israelite to catch their breath and wonder what was beyond. The gold hinted at the beauty of the fellowship available to the priests beyond the door. 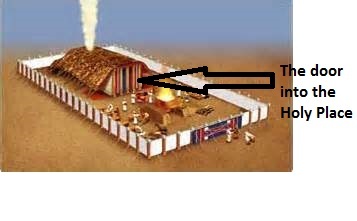 But the average Israelite would never enter the Holy Place. The door shut off the Holy Place from the Outer Court of the Tabernacle. While the Israelites were free to come into the Outer Court to bring offerings, it was only the priests who were allowed to enter the Holy Place to minister to the Lord and for fellowship with Him. Primarily though, in contrast to the Veil, the Door was a place of entrance, but only for those qualified – the priests. Twice daily the priests entered the Holy Place through this door to tend the lamps of the Golden Lampstand, to burn incense on the Golden Altar and to eat of the bread from the Table of Shewbread. 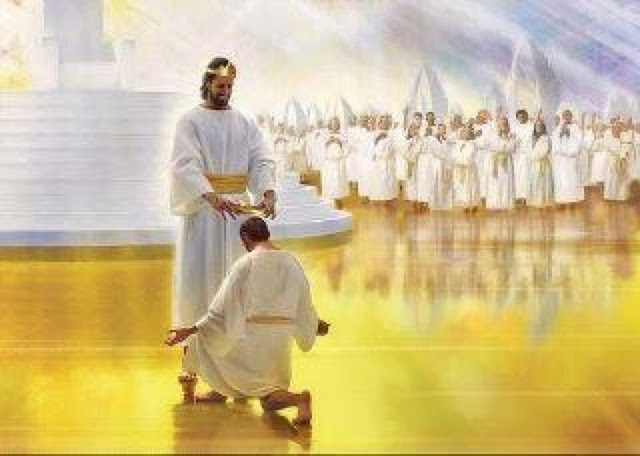 However today we are in the New Covenant and the Bible says that all believers today are a “royal priesthood” (1Peter 2:9). So we now have the privilege of entering through the Door (Jesus Christ) into the presence of God for fellowship. Once our relationship has been established through our faith in the finished work of Christ at Calvary (the brazen Altar) and we have been cleansed by the Word (the brazen Laver) we do not have to stay shut out in the Outer Court wondering about the beauty of the Holy Place. We each have the privilege and responsibility of entering into fellowship with God in the Holy Place. We each have the joy of moving onward from the brass (judgment) of the Outer Court, where Jesus took the judgment for our sins, and into the gold of getting to know our wonderful Saviour. The priests daily entered into the Holy Place for fellowship with God. It may be asked – do we also enter the Holy Place daily for fellowship with God? Are we still out in the Outer Court or have we moved forward into fellowship with God? Categories: Jesus and The Tabernacle | Tags: Christian, Christianity, door, gospel, holy place, Jesus Christ, Moses, significance, tabernacle, teaching | Permalink. It breaks my heart that I can now visit a church and not hear His Name even mentioned. He who is the Door, is now outside the door. Of which Christ is Head! I wonder who is willing to go to Him there? Who is willing to let go of Christianized kingdoms? Who is willing to forgo Christian-fame? Who is willing to lose friends for Him? Who is willing to be considered a crack-pot for Him? To bear with Him His reproach? 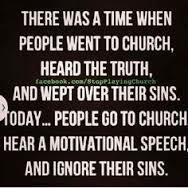 This will be the test of the Christian in these the last days. Categories: Poems | Tags: Christian, Christianity, church, Jesus Christ, laodicean, last days, poem, poetry, prose | Permalink. “Crystal meth is the devil’s drug,” Jacob said. “You mean ice?” I asked. “Yeah,” he answered, “It is the devil’s drug. I was on it. It ruined my life. I lost my family and my friends. I was talking to Jacob last night on the street. A young guy who looked like he had done some heavy stuff in his young life. Ice is crystal methamphetamine, a synthetic drug, in its purest form. Ice is now endemic in Australia. The government and law enforcement are powerless against this demonic drug, but so far are unwilling to admit that they have lost control and have no idea what to do about it. I believe that we are entering a new season my brothers and sisters. And ice is only a small part of what is coming. God is going to all0w everything that can be shaken to be shaken. Everything we have trusted in – money, global economics, security, the things Western culture was built on, even Christianity – everything that can be shaken will be shaken. All this was prophesied 2000 years ago, and it is happening right NOW. There’s not time left now. God is permitting a huge shaking to come and it is going to begin in the church. Because He needs to sort the wheat from the chaff. the chaff breaks off. The wind then catches the useless chaff and blows it away, leaving only the lovely kernel of wheat. Jesus is now looking to see who will stand. Who will stand when the shaking comes? 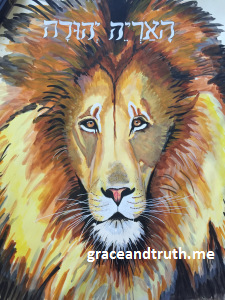 When all we have put our trust in topples and falls… will we be blown away as chaff? Where will we put our trust… Will it be in Christ alone? This is it my friends. 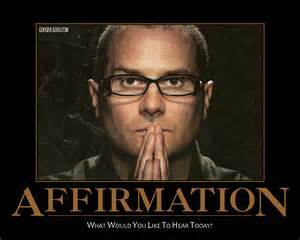 Now is the time to topple Self off the throne of your life and allow the rightful king back on His throne. It is Jesus Christ only who will provide refuge in the coming storm. It is Him alone who can save you. Jacob said to me last night on the street after I’d shared the gospel with him that he is the “god of his own life”. Yeah, because no one says the honest, blatant truth anymore. The essence of sin is self-love. That is it. The devil had it, he tried to elevate himself to god-hood and he is on his way to the lake of fire to burn with the chaff for eternity. There’s no time left for seeker-sensitive rubbish and I can’t be bothered with it anymore. For goodness sake, Christ has died for us. 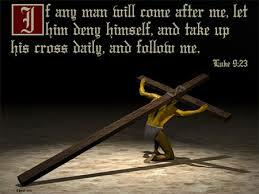 He took the punishment for your sin and mine at the cross. He shed His sinless blood to pay for our horrendous crimes against God. What wondrous love is that? What more could He do? Get right with God now or face Him at the judgment seat of Christ. Your choice. Jacob took a New Testament last night. He said that he is going to seriously consider what we talked about. I pray that he will. I pray that you will too. 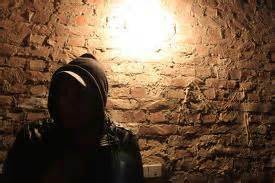 Categories: Street Preaching | Tags: Christian, Christianity, drug, ice, Jesus Christ, last days, ministry, preaching, self, street | Permalink.